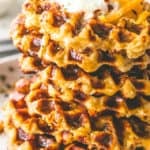 Cheesy Potato Waffles – Delicious, cheesy, and savory waffles prepared with leftover mashed potatoes and cheddar cheese. 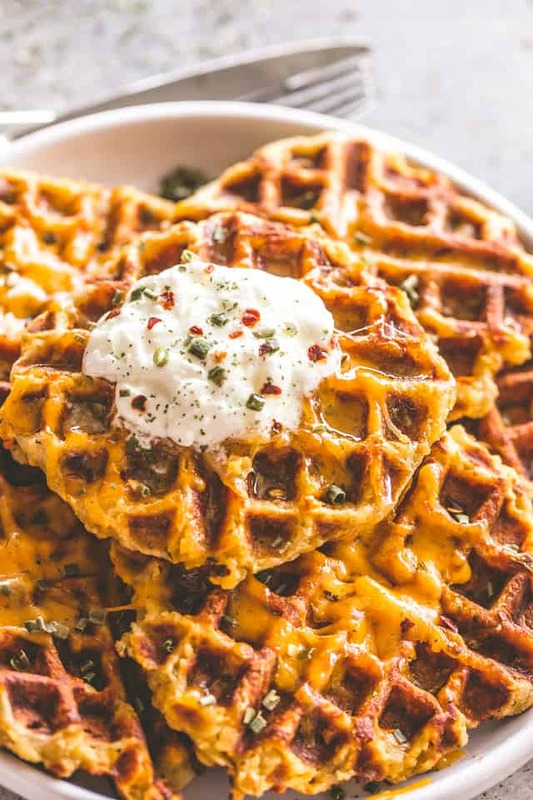 Crispy on the outside and fluffy on the inside, these potato waffles not only taste amazing, but they are a super fun meal to serve to your family. 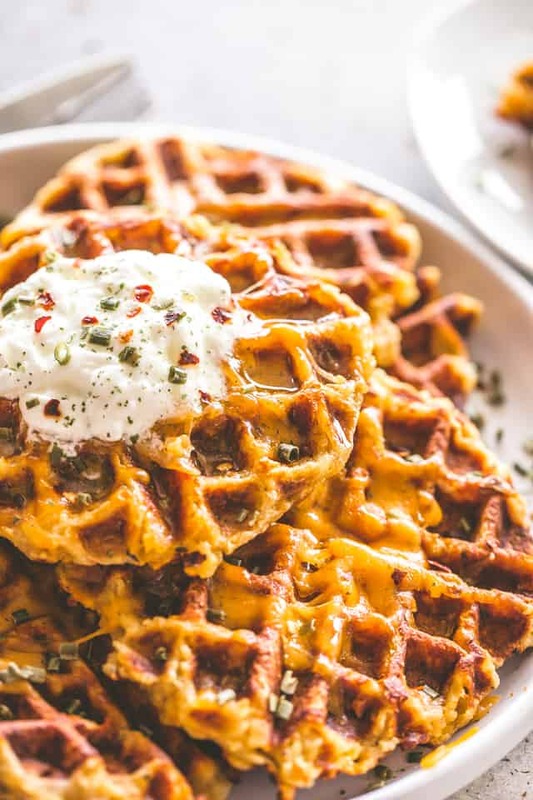 Cheesy Potato Waffles! 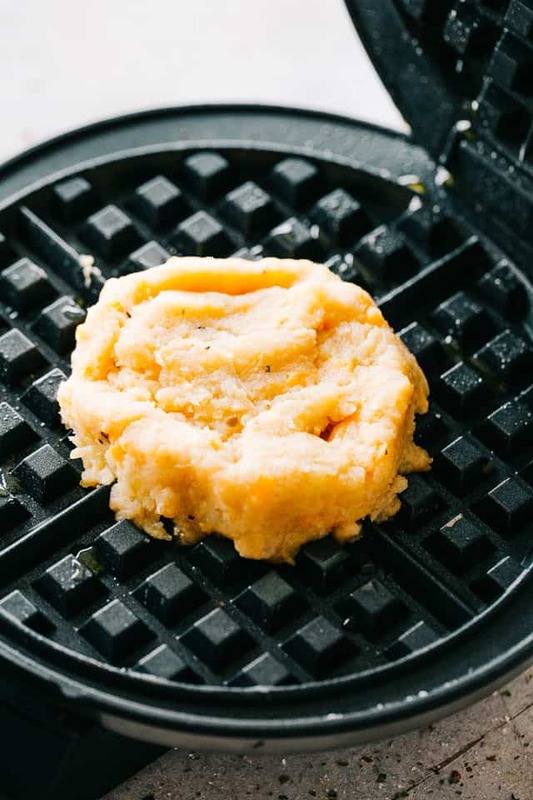 Yep, we are actually putting (mashed) potatoes in a waffle maker and lovin’ it! These potato waffles are a wonderful brunch recipe that’s sure to impress your guests. Serve them simply topped with sour cream and chives, or fully loaded with bacon and green onions. I am known to repurpose food over and over again. I’m pretty sure I’ve told you this before, but I can’t get myself to throw away food. For that reason, I find new ways to use up our leftovers. For instance, these Spinach and Garlic Potato Patties, or my Sweet Potato Shepherd’s Pie. All so darn delicious and all made with leftover food. But, that wasn’t the case here. 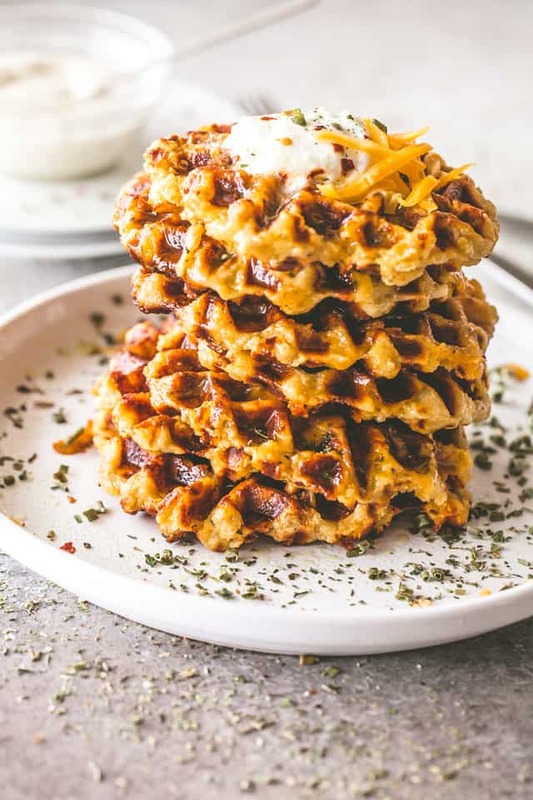 Cheesy Potato Waffles are made with just a handful of ingredients, they’re also VERY quick to make and are naturally gluten free. 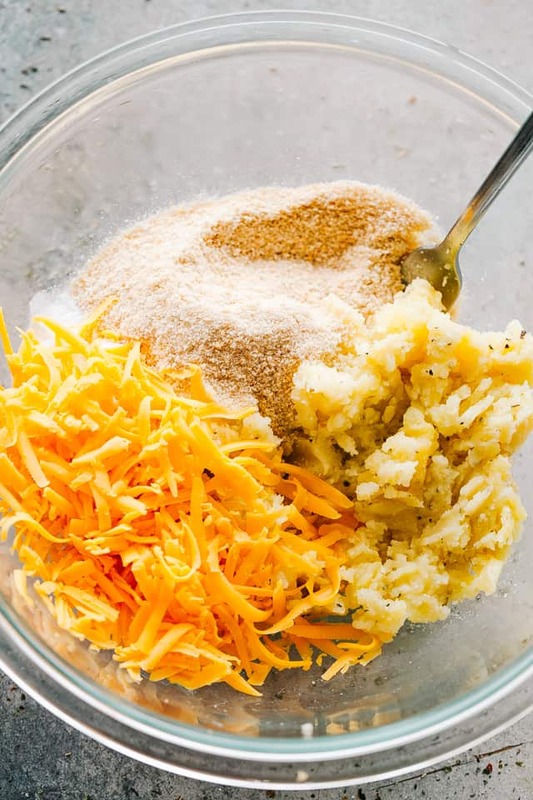 We are basically taking our leftover mashed potatoes and stirring in eggs, seasonings, panko crumbs, cheddar cheese, milk, and chives. Make sure to mix those together really well, until fully incorporated. The consistency will be thicker and it won’t resemble a waffle-batter. If you feel that it could use more liquid, go ahead and add a little. However, the batter should not be runny at all. Keep in mind, everybody’s recipe for mashed potatoes is going to vary in texture and moisture, thus, use your best judgment. Next, pinch off about 1/3 cup of potato mixture and make a patty. I weighed mine and used exactly 2-ounces per patty. Transfer the potato patty to a greased and preheated waffle iron/maker; close and cook for 3 to 4 minutes, or until cooked through and browned on top. Remove from the waffle maker, add more cheese, if you like, spoon some sour cream on top, and serve. We could say these are basically potato pancakes, or latkes, but without all the greasy clean-up and calories from pan-frying. Add in some crumbled bacon, or shredded chicken, even leftover turkey meat. I think feta cheese + turkey meat would be really good. But, play them up however you want – they will be great. I should also add that these are excellent for school lunches. Hot or cold, the potato waffles are delicious, especially when served with a side of yogurt or sour cream. Even a runny egg on top! YUM! 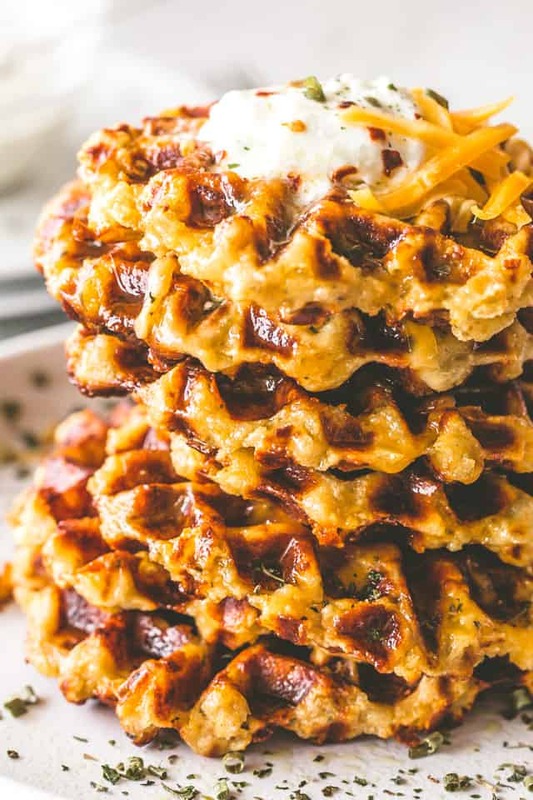 Delicious, cheesy, and savory waffles prepared with leftover mashed potatoes and cheddar cheese. Preheat waffle iron and grease with cooking spray. Combine all of the ingredients, except for the sour cream, in a large mixing bowl; mix and stir until thoroughly incorporated. If you want smaller waffles, scoop out about 1/3 cup of the batter and form into a patty. For bigger waffles, use 1/2 cup of the batter. For a perfect serving size, use 2 ounces of the batter per waffle. Transfer to preheated waffle iron and close; cook for 3 to 4 minutes, or until cooked through and browned on top. Cooking time will depend on the size of the waffles. 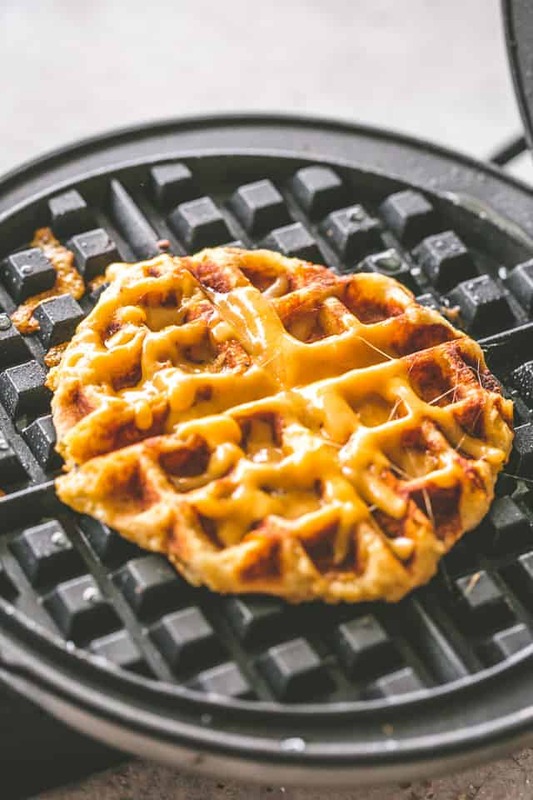 Remove from waffle iron, top with a sprinkle of cheese (optional) and set aside. Serve the potato waffles with sour cream and fresh chives. Everybody’s recipe for mashed potatoes is going to vary in texture and moisture; if the waffle batter looks dry and is not holding together, add more liquid or one more egg. If it looks too wet, add more panko crumbs. You are looking for a mixture that is cohesive and not runny.